I’ll share some news first and then return to activism. Last week was filled with climate change news. Here are some highlights. On Wednesday, the journal Nature published a major study that covers the years from 1951 to 1999. It concludes: “The research directly links rising greenhouse–gas levels with the growing intensity of rain and snow in the Northern Hemisphere.” This, however, is not news but affirmation for the tens of millions people in Pakistan, Australia, China, and parts of the US who suffered from devastating floods or severe winter storms during the past year. Also last week, the journal Climate Change Letters published a study led by University of Arizona scientists that concludes rising sea levels could threaten 180 coastal cities in the US by 2100. Brace yourself—we’re in for a rough ride. But the real bad news is that the Republican–controlled 112th Congress is determined to make this ride much more painful for everyone. On Thursday, the House Republicans and 13 Democrats passed a measure with 249–179 votes that would take away the Environmental Protection Agency’s (EPA) authority to regulate greenhouse gas emissions through the Clean Air Act, slash the EPA’s budget by $3 billion, and defund the top White House climate change offices—including the climate advisor to the President (a position formerly held by Carol Browner) and the US climate change negotiator to the United Nations (currently held by Todd Stern). Philip Radford of Greenpeace wrote these words in the Huffington Post: “With no one to run the EPA, no money to run it with, and little authority to do anything, the EPA would barely be more than a ceremonial body.” This Congress, with Representative Fred Upton (R–Michigan) at the helm as chairman of the House Energy and Commerce Committee, is determined to sell America’s public health and the future of our children and grandchildren to the coal–and–oil empire. Upton’s bullock cart to take us back into the twentieth century isn’t moving without resistance. Senator Barbara Boxer (D–California), chairperson of the Senate Environment and Public Works Committee, is committed to fighting. On Tuesday, Politico reported in a story titled Fred Upton vs. Barbara Boxer, “she’d [Boxer] do everything in her power to stop what she described as his [Upton’s] illegal legislative plan to stop EPA climate rules.” Boxer isn’t alone; there are many on her side. We have to join the fight and ensure that the wheels of Upton’s cart get stuck in wet mud. If the EPA is made defunct, undoubtedly the underprivileged communities will suffer the most. Without anyone to monitor toxic dumping of industry it’ll become a public health nightmare for these communities who are already under great stress from the economic depression. Each day we learn more about the ugly truth of the great chasm between Main Street and Wall Street. But we must also never forget that so much life in this great nation and on our earth does not live on either of those two streets but in deserts, forests, mountains, oceans, rivers, tundra ... We must do whatever we can to ensure the survival of all those non–street dwellers as well as those of us who do live along or on streets. There are predators everywhere, but the great irony is that the top predator of the non–street world (the polar bear) is struggling to survive the wrath of carbon in the air, while the top predators of the street world (Chevron, Exxon, Koch Brothers, Peabody ...) are making astronomical profits by helping everyone put more carbon in the air. Any meaningful climate change policy in the US seems impossible because influential Beltway politicians are pouring jugs of pure ghee (read: deregulation) into the fire of corporate greed. In return, they hope the corporate gods will be pleased and offer generous blessings come 2012. Climate scientist James Hansen gave the world a number: For our earth to support life as we know it, the atmospheric concentration of CO2 should not exceed 350 ppm. Right now it is nearly 390 ppm. It is no surprise that we’re having extreme weather events affecting tens of millions of people all around the planet. 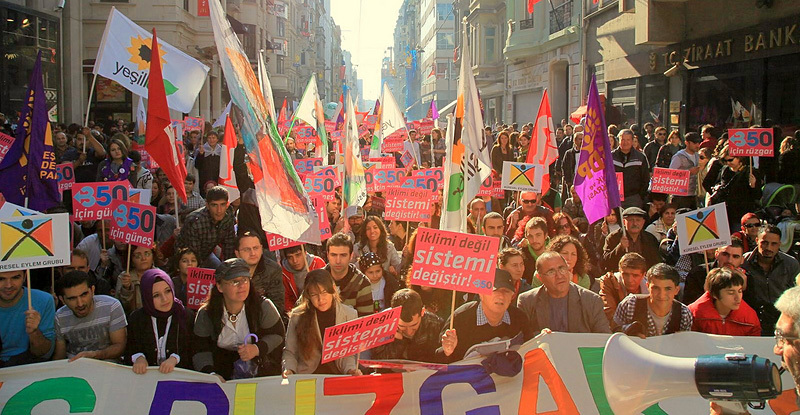 350.org 10–10–10 Global Work Party, Istanbul, Turkey, 2010. Photo courtesy 350.org. Environmental writer and activist Bill McKibben and his colleagues started 350.org in 2009—a global movement to raise awareness about bringing down the CO2 concentration to 350 ppm—that is, cleaning up our air to make it habitable for all life. They have successfully organized the most widespread actions of any cause ever in the history of this planet: 5,200 climate rallies in 181 countries in 2009 and 7,000 work projects in 188 countries in 2010. Because of their efforts, citizens from all over the world now know “what we want”—we want the carbon concentration in our atmosphere to come down to 350 ppm. Their message is so simple that, like art or music, it has broken all barriers of language and culture in bringing people together—an incredible achievement. The 350.org movement is growing by the day and I hope you’ll lend your voice, too. Any time we frame something as what we don’t want, it becomes confrontational, and the solutions are often revolutionary. Take, for example, The Poet, an essay written by Emerson. He didn’t want any more bad poetry to be written in America. Perhaps he didn’t want European poetry written in America by American poets. He wanted something original. Whitman took the challenge and wrote Leaves of Grass. It was revolutionary and pissed off the establishment, but in the process it changed American poetry forever. Climate change activism—or, possibly better framed as Earth activism—is really about fossil fuels: the need to reduce consumption of coal and oil and stop new destructive extraction projects. As it happens, in the US we’ve been framing that activism movement with “what we don’t want” for some time now. 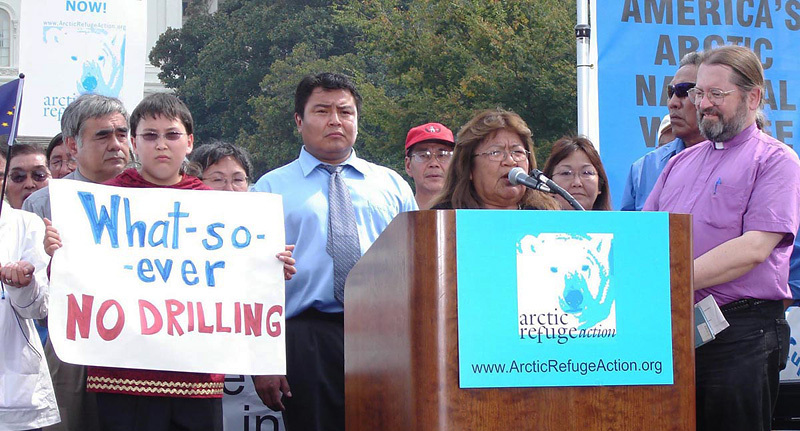 The campaign to save the Arctic National Wildlife Refuge from industrial development has been going on for the past fifty years. Without a doubt this is the longest running and perhaps the most inclusive ecocultural activist movement anywhere on earth. I’ve been deeply involved in it for the past ten years. First, what we want: permanent protection of the coastal plain of the Arctic Refuge, the most biologically diverse area in the entire circumpolar North that also supports two indigenous communities, Gwich’in and Inupiat. That demand has not yet been met. Next, what we don’t want: oil development in the coastal plain of the Arctic Refuge. Such “don’t want” framing has been crucial for the long life of the movement, and it was particularly necessary during the George W. Bush era. Shell has been trying to drill for oil in the Beaufort and Chukchi Seas of Arctic Alaska. Last year I wrote numerous pieces about the topic with a simple framing—we don’t want Shell to BP the Arctic. I also wrote in response to Shell’s massive ad campaign, particularly the “Let’s Go” and the “We Have the Technology” ads. A top executive from the Shell headquarters in the Netherlands emailed me to discuss further, but before such a discussion could take place, the EPA board blocked Shell’s air quality permits and Shell abandoned drilling plans for 2011. The Inupiat communities and the environmental organizations launched a campaign few years ago that also included several legal suits (I provided declarations for some of these) against Shell and the US Department of Interior. When a concerted citizens’ effort to stop something that is clearly wrong wins, however temporarily, it gives us all the more reason to continue our work. In activism, there is no final win, just ongoing engagement. Another example is the sustained citizens’ campaign to stop mountaintop coal mining in the American southeast. The latest was a civil disobedience action led by writer–philosopher Wendell Berry. Before that, there were several protests in which James Hansen participated and was arrested. One key element in that fight is the EPA’s Clean Water Act, as mountaintop coal mining severely pollutes the waterways, killing fish and whatever else may live in those rivers and creeks. That movement is framed with a simple “what we don’t want” statement—we don’t want mountaintop coal mining because it destroys public health, the livelihoods of the people, and the ecology of the region. The EPA is under attack from the Republicans, and we must fight to protect the very agency that works to protect public and ecological health in America. Is this a private fight or can anyone get in it? That was the title of Bill Moyers’ keynote speech at the 2011 History Makers conference. Earth activism is a public fight. Please join in and say what you don’t want in your community. Subhankar Banerjee’s photographs can be seen this spring in solo exhibitions Arctic National Wildlife Refuge: Celebrating Fifty Years at the Burke Museum of Natural History and Culture in Seattle (February 15–July 10, 2011) and Where I Live I Hope To Know at the Amon Carter Museum of American Art in Fort Worth (May 14–August 28, 2011), and in a group exhibition Earth Now: American Photographers and the Environment at the New Mexico Museum of Art in Santa Fe (April 8–August 28, 2011). He was recently named an Arctic Hero by Alaska Wilderness League and was appointed Director’s Visitor at the Institute for Advanced Study at Princeton for fall term 2011. Subhankar is currently editing an anthology titled “Arctic Voices” (Seven Stories Press, 2012).